Special Olympics North Carolina is proud to announce that Officer Phillip Smith of the Chapel Hill Police Department has been selected to serve as part of the Final Leg team, serving as a Guardian of the Flame® as he runs the “Flame of Hope” throughout the United Arab Emirates (UAE) in March, leading up to the start of the 2019 Special Olympics World Games in Abu Dhabi, UAE. Final Leg runners from around the world were selected to proudly represent their local Torch Run and Special Olympics Programs. The Final Leg team will embark on different routes, running the Flame of Hope throughout cities and communities across the United Arab Emirates at various events, honoring the spirit of the Special Olympics global movement and delivering a message of hope to communities where people with intellectual disabilities continue to fight for acceptance and inclusion. The Final Leg Team will safely deliver the “Flame of Hope” to the 2019 Special Olympics World Games Abu Dhabi Opening Ceremony on March 14. As one of 112 members of law enforcement chosen, North Carolina’s own Officer Smith was selected to participate on the 2019 Abu Dhabi World Games Final Leg Torch Run Team. “I am unbelievably humbled to be selected to represent all the brave men and women here in Chapel Hill and across the state that support Special Olympics athletes,” Officer Smith said. “Officer Smith is an integral member of the North Carolina Law Enforcement Torch Run’s leadership. This is a well-deserved honor he will represent his community and the state well in Abu Dhabi,” said Keith L. Fishburne, President/CEO, Special Olympics North Carolina. The Law Enforcement Torch Run® Final Leg for the 2019 World Games will take place from March 3 – March 14. A team of 112 members – which includes 96 law enforcement officer runners, 10 Special Olympics athletes, and logistics personnel – will serve as Guardians of the Flame as they run the Flame of Hope throughout the UAE. The Final Leg and community visits will raise excitement for the World Games throughout the country. The Law Enforcement Torch Run® for Special Olympics (LETR) is Special Olympics’ largest grass-roots fundraiser and public awareness vehicle in the world. 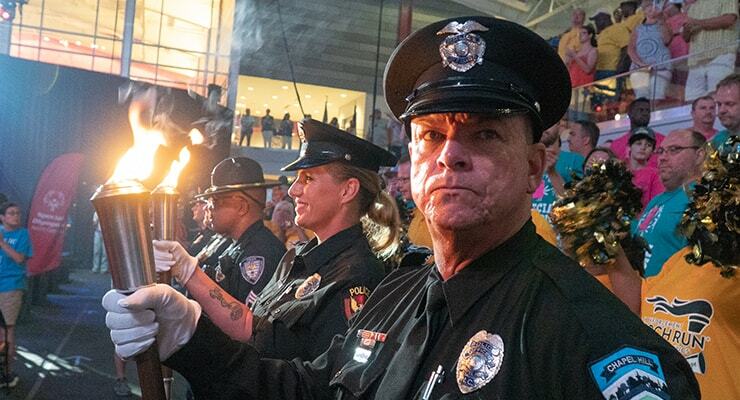 Nearly 100,000 law enforcement members in all 50 U.S. States, 12 Canadian provinces/territories, and 44 countries contribute to LETR efforts annually as Guardians of the Flame®, ensuring the delivery of the Special Olympics Flame of Hope to the Opening Ceremony of local Special Olympics competitions, state/provincial Games, and national/regional Games. Special Olympics is a global movement that unleashes the human spirit through the transformative power and joy of sports, every day around the world. We empower people with intellectual disabilities to become accepted and valued members of their communities, which leads to a more respectful and inclusive society for all. Using sports as the catalyst and programming around health and education, Special Olympics is fighting inactivity, injustice and intolerance. Founded in 1968 by Eunice Kennedy Shriver, the Special Olympics movement has grown to more than 4.5 million athletes in 170 countries. With the support of more than 1.4 million coaches and volunteers, Special Olympics delivers 32 Olympic-type sports and more than 94,000 games and competitions throughout the year. Special Olympics is supported by individuals, foundations and partners, including the Christmas Records Trust, the Law Enforcement Torch Run® for Special Olympics, The Coca-Cola Company, The Walt Disney Company and ESPN, Microsoft, Lions Clubs International, Toys”R”Us, Mattel, P&G, Bank of America, Essilor Vision Foundation, the B. Thomas Golisano Foundation, Finish Line, The Safeway Foundation, and Safilo Group. Visit Special Olympics at www.specialolympics.org. Engage with us on: Twitter @specialolympics; fb.com/specialolympics; youtube.com/specialolympicshq, instagram.com/specialolymics and specialolympicsblog.wordpress.com. The 2019 Special Olympics World Games in Abu Dhabi, scheduled for March 14-21, will be the largest sports and humanitarian event anywhere in the world, with 7,000 athletes and 3,000 coaches representing more than 170 countries. The World Games will be an unprecedented display of the spirit, joy, courage and skill that are hallmarks of the Special Olympics movement. The largest single event ever held in the United Arab Emirates (UAE) and the first Special Olympics World Games in the Middle East, the World Games features 24 officially sanctioned Olympic-style sports in venues throughout Abu Dhabi. The spectacular Opening Ceremony on March 14 is expected to attract 45,000 spectators while being viewed by millions worldwide via global broadcast partners ESPN and Abu Dhabi Media. For more information on the Special Olympics World Games Abu Dhabi 2019, including volunteer and sponsorship opportunities, visit AbuDhabi2019.org, and see us on social media at on Facebook,Twitter and Instagram.